Does any one have an original BSA ignition key that came with their bikes. A photo? what does it look like. There are many "styles" available, but what is correct? I believe I still have the original key from my '67 Lightning... somewhere... Anyway, I remember that the handle end is square and says "Union" on it. I'm curious, why do you ask? I doubt you will ever find an OEM working power switch and matching key (the operative word being "working"). However, I believe I also have the original (non-working) key switch from my '67, if this is something you would be interested in having. My '67 has the original switch and original key. It is the only key I have for it too. I keep meaning to have a copy made and use it, but just haven't gotten around to it yet. It is at my shop now, I'll try to get a picture of it tomorrow and post it. This will be coming up to your town next week. The Owego Emergency Squad bought a used ambulance from the company I work for. We design, sell, and service new and used ambulances. We did some minor repairs, added new lettering and graphics to the unit. The vehicle is scheduled to go up to Owego tomorrow, and join the fleet. I just thought it was interesting that I am in Central New Jersey, and that this vehicle was in our yard ready to go up to Owego. It wouldn't have meant anything, except, I see you are from Owego NY. I took a shot that maybe you were familiar with the Owego Emergency Squad. Sorry if I confused. Does it look as it should? And inplace of pulling a plug or turning the fuel off, you got a screwdriver and turned the key off, did whatever you were going to do then realized what you had done when you went to start the bike. So it was either brake the switch with the afore mentioned screwdriver or pull the plug & do some hot wiring. If you did the latter then as sure as poo is brown you got pulled over for somthing on the way home then had to do some explaining to a not very amused constable. Yes I remember those days very well. My '71 Triumphs have the square head key that Mark Z is referring to. 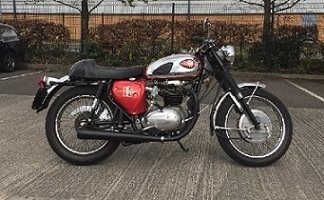 My '66 BSA has a round head key which, while I don't have it in front of me at the moment, appears to be the same as the one in your picture. I am not the original owner, so I can't swear that it is the original key, but I have no reason to believe its not. I am in Ewing right down the road from you. West Trenton Hardware has blanks to make you a duplicate. We ought to get together and swap lies some time. You probably go to the meeting of the Nortons at Washington Crossings? Are you one of the sunday breakfast guys at Orlandos too? Yes, as the the Norton Spring Opener. I quit going to Orlando's for breakfast a number of years ago, but still show up occasionally to bike watch and chat. Royaloilfied, who also posts on this site lives in Hopewell, and Rocketscientist lives in Hamilton. Both chums. Been in Hopewell since 1980. BSA, Norton, and 2013 Triumph Trophy. Don't think I have run into either. What do the above three posts have to do with "1966 BSA Lightning ignition key?" There are a fair number of Brit bike types through out our general area. I have BSAs, Triumphs, a Norton Atlas, a Velo, a bunch of little Italian bikes and a couple of old Jap bikes. Royal Oilfield has some old enfields and an Atlas also. Rocket Scientist has a couple of Velo's. There are a number of other folks too. Do you get to Orlando's often? I do NOT go to Orlando's. I remember reading it some where, have pasted by a few sunday mornings, and saw a collection of brit bikes outside. There is a big group that gathers there for the Norton gathering. The Norton gathering has grown in popularity over the years. I enjoy the Norton gathering. Many interesting bikes. Its a great couple hours of looking at the bikes I like to see. Last edited by nert; 02/07/19 10:34 pm. +1 for the Gathering of the Nortons at Washington Crossing. I have a badge for the 2018 meet there--there were only about 50 bikes there as the weather was terrible. I think the number of bikes in 2017 was about 600 (good weather). If I remember correctly that was the time that Ed gave a friend of mine a lift in his pick up when his BSA died on the road. And Orlandos for Sunday morning breakfast from time to time in the summer. BTW--Irish--if you want to join in this conversation you have to move to Jooooisey! Very cool, thanks! My wife says she saw what is probably the new vehicle today, the inside being cleaned outside the Owego fire station. I SHOULD be familiar with the Squad - three weeks ago they rushed me to the hospital in the middle of the night for emergency hernia surgery! I have much respect and gratitude for the people that operate, volunteer, give of their time and resources to aid their neighbors. If I'm not mistaken, that department operates on a very thin and illusive budget. Hopefully your surgery turned out to be a success, and you will soon be able to kick thru that wonderful bitsa and enjoy the music it makes. 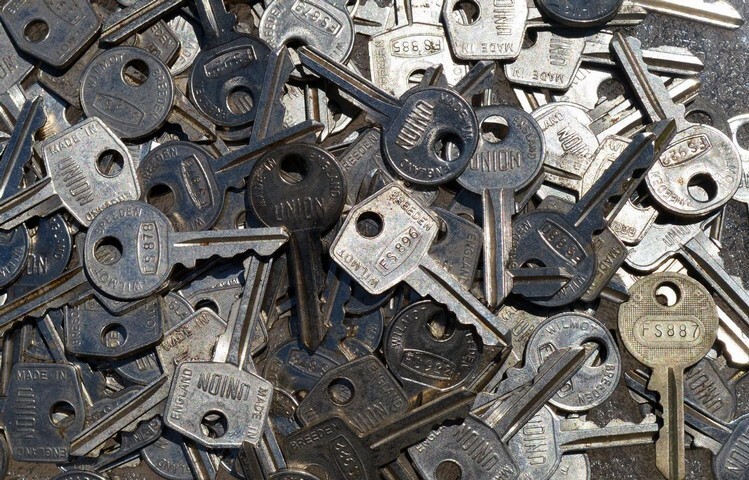 Original 1967 Lightning keys. Rectangular head ignition. Round is for steering lock. Letter codes are for equipped locksmiths to copy. They used the same system for the cars too. I have a very nice Lucas key and tumbler set from Baxter Cycle. To get the old one out, Do I turn ignition switch clockwise, and depress the ball. then turn more clockwise before removing, or do I just try to remove the tumbler straight out after depressing the ball? I hope you have bikes for all those keys.